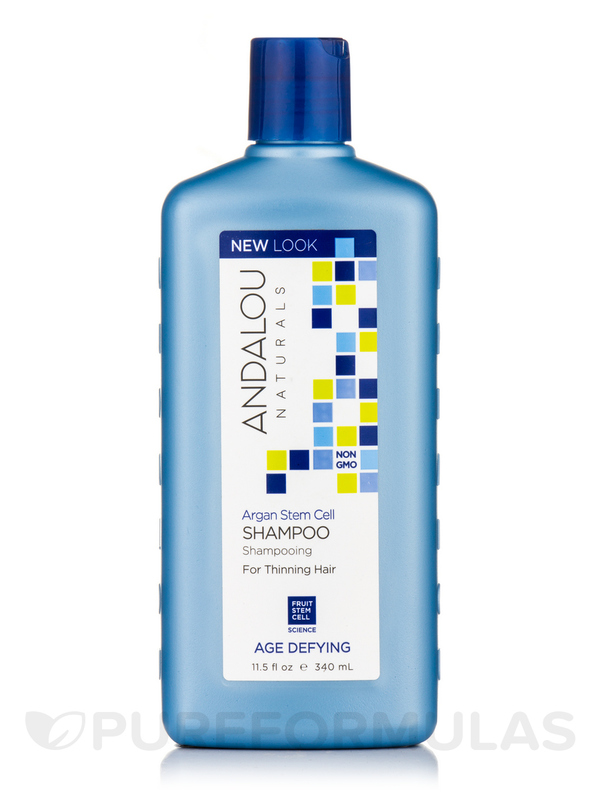 Age Defying Thinning Hair Treatment Shampoo by Andalou Naturals smells so good! It works super well and gives my hair shine. Age Defying Thinning Hair Treatment Shampoo 11.5 fl. Oz from Andalou Naturals supports hair vitality by fortifying it with nutrients and other essentials. With ingredients such as aloe vera‚ grape seed‚ argan‚ Quinine bark‚ Medowsweet‚ white tea‚ hibiscus and more‚ your hair will be well taken care of. This shampoo from Andalou Naturals fortifies hair fibers from split end conditions and strengthens each strand from breakage. This shampoo may well add that extra bounce to the hair you've been looking for and amplify texture and body. While it cleanses and stimulates‚ this shampoo from Andalou Naturals may also actively nourish hair for a healthy shine. 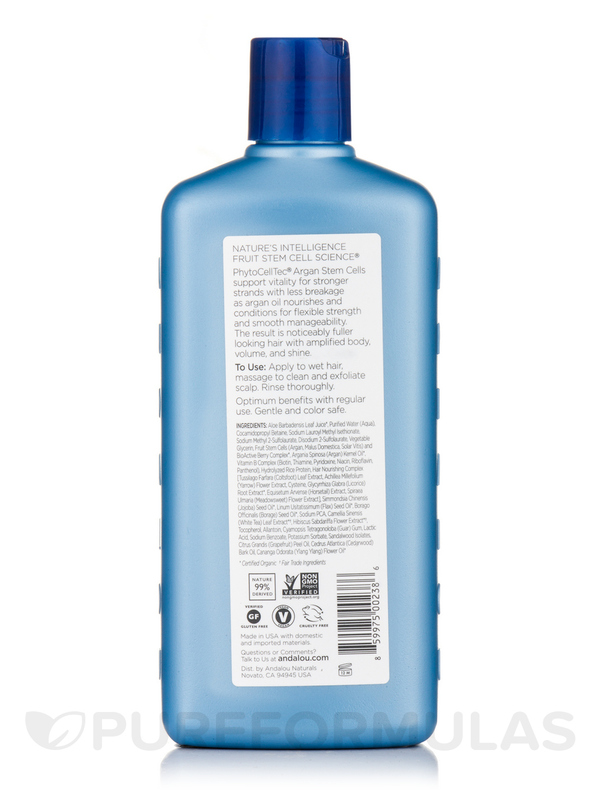 Aloe vera present in this shampoo may alleviate the conditions of itching and dryness. It also contains proteolitic enzymes that help in hair growth. The enzymes clear the hair follicles of clogging and allow better nutrient penetration. This helps in the promotion of hair growth. Grape seed extracts present in this shampoo from Andalou Naturals contain flavonoid-rich properties and one of the most powerful antioxidants‚ oligomeric proanthocyanidins (OPC). It is believed that OPC helps scavenge free radicals and nourishes hair. Many people believe that grape seed extract is a nutrient rich conditioner that revitalizes and strengthens hair. Argan Oil present in this supplement is rich in essential fatty acids and helps smooth the frizz and helps soften hair. This oil may even reduce split ends. Get Age Defying Thinning Hair Treatment Shampoo 11.5 fl. Oz from Andalou Naturals and give your hair the wonderful treat of healthiness. Non-GMO Project Verified / Vegan / Vegetarian / Cruelty-Free / Gluten-Free. Apply to wet hair‚ massage to clean and exfoliate scalp. Rinse thoroughly. I have baby fine hair, so the smallest thing will make me lose hair, make it break, make it limp, or make it fall out. But, I gave this a try. And, WOW! The first few washes, I had bits coming out of my follicles and then I had hair starting to grow! I now have hair several inches long and am having to spray it down. Soon, it will blend it perfectly with the rest of my hair!!! So excited! GROWS my delicate hair! Lovely smell. Age Defying Thinning Hair Treatment Shampoo by Andalou Naturals is a solid option for a shampoo, especially a non-GMO one that's cruelty-free. However, I can't say with any certainty as to whether it helps prevent thinning hair. My hair thinning didn't get worse, but I don't know if it improved. Not sure that it helps make hair fuller or prevent thinning. Age Defying Thinning Hair Treatment Shampoo by Andalou Naturals is not what I expected. Made hair silky and shine but no puff or volume. I bought Age Defying Thinning Hair Treatment Shampoo by Andalou Naturals because my hair is thinning and I really like Andalou products so I thought I'd give this a try. I did not care for the smell but l like the way my hair feels. I am not sure if I will purchase this shampoo again. I did not care for the smell of this shampoo. I got Age Defying by Andalou Naturals for my husband's thinning hair, But I use it just because it smells so good. Leaves hair clean & soft even with our hard water. When I ordered Age Defying Thinning Hair Treatment Shampoo by Andalou Naturals about 5 months ago, I was having hair shedding more than normal. After using Age Defying Thinning Hair Treatment Shampoo, my hair shedding has stop to just a very small amount of shedding. My hair over all feels healthy & smells nice, it has super fresh scent. I will be rebuying more of the Andalou Shampoo & Andalou Conditioner. I bought Age Defying Thinning Hair Treatment Shampoo by Andalou Naturals for my fine and thin hair. 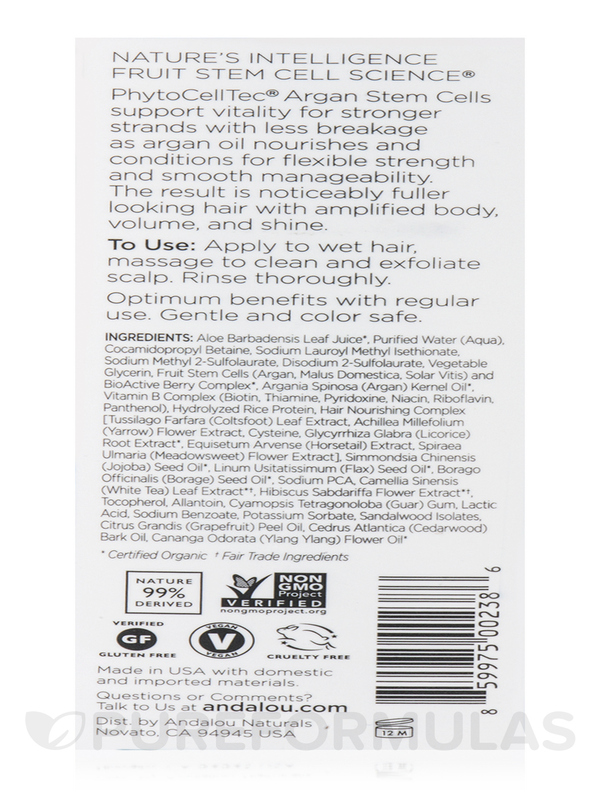 It leaves my hair soft and full of shine with more volume. I have only been using it for a week so I am not sure if it will promote hair growth at this point. I like this product a lot so far. Leaves hair soft and shiny and with more volume. A little bit more difficult to lather than a typical lower end shampoo, but I can work with that. Age Defying Thinning Hair by Andalou Naturals made my scalp & Hair feel completely clean & it gave my hair A super clean scent. I like it because its all Natural and I feel Age Defying Shampoo did make my Hair & Scalp super clean & made my Scalp feel good. I also like this company PureFormulas.com. There's nothing that I dislike about this product. It's A 100% Great Product!